Last week I flew from London to Bali (Denpasar). On my first flight I flew from London Gatwick to Singapore on Norwegian’s new 787-9 Dreamliner in their premium cabin (review coming soon). I then had a short overnight layover at the Park Avenue Changi Hotel before flying to Denpasar on Singapore Airlines new 787-10 Dreamliner in their business class cabin. I always like flying on Singapore Airlines, living in Bali for part of the year it’s my ‘go to’ airline for any travel within South East Asia when I’m in the region and I will go out of my way to fly with them. Why? 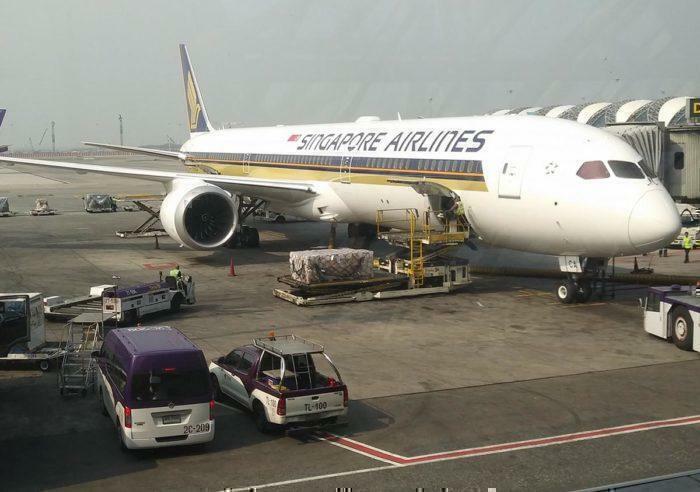 There is always great business class reward space last minute, intra asian flights with Singapore Airlines are often served by 787-10’s or A350’s with full flat beds, and the service is always AMAZING! To this day, I have never had a bad flight with Singapore Airlines. I was flying on Singapore Airlines Flight 942, I boarded the flight at around 8:25AM after a very short stint in the Silver Kris Flyer lounge at Changi. On the lounge visit I did not get enough time to get photos for a review however I will be flying back through Singapore in 3 weeks to review the lounge in full. Upon boarding as it was a morning flight we were offered a pre-departure beverage of orange juice, apple juice or water. I got settled into my seat and started watching a film. 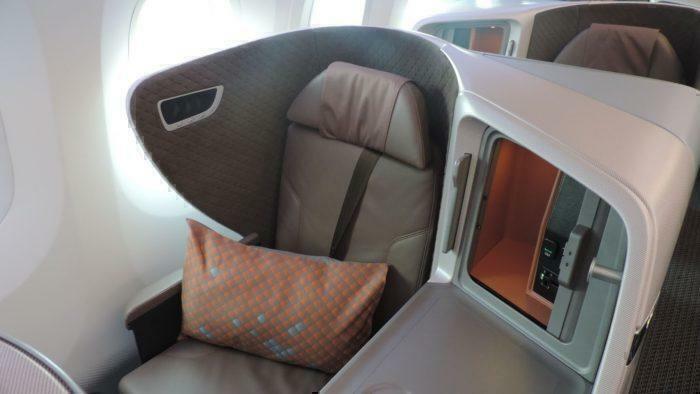 The Singapore Airlines 787-10 Dreamliner has a total of 30 business class seats in a 1-2-1 layout and each seat goes into a full flat bed and has 30 inches in width. There is then 300 economy seats in a 3-3-3 configuration with a 19 inch width! The Singapore Airlines 787 economy seats in my opinion are probably nicer than British Airways 787 premium economy which have a width of just 18.5 inches! Before flying I was offered the option to ‘Book The Cook‘ – this is available to all business class passengers on select routes. I opted for poached eggs served with hollandaise sauce and it was great! The benefits of booking the cook is that your meal will often be served first and the service will be even more attentive. As well as the meal the cabin crew kept on coming around the cabin offering more drinks/snacks around every 15 minutes. I paid 17,500 miles + $47.30 SGD (approx $34 USD). Availability for this flight is very good, most days you can book on it. Here is a flight available on December 11th this year. The same flight if paying would cost $852 USD which is crazily expensive, and probably not worth it if paying. 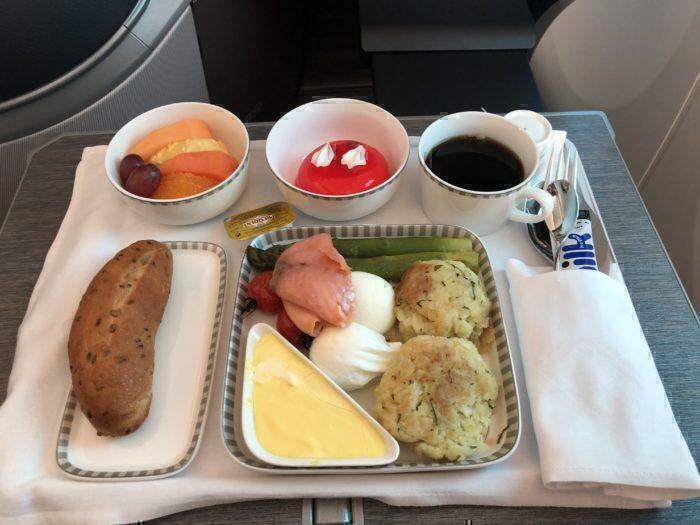 This flight was probably one of the best flights I have ever done and sitting in Singapore Airlines new business class cabin was amazing, especially after a 12 hour flight in Norwegian’s sub par premium cabin the previous day. I will be flying on the return leg of the flight from Denpasar to Singapore in a few weeks so I will be writing a follow up review soon! Those poached eggs look tasty!